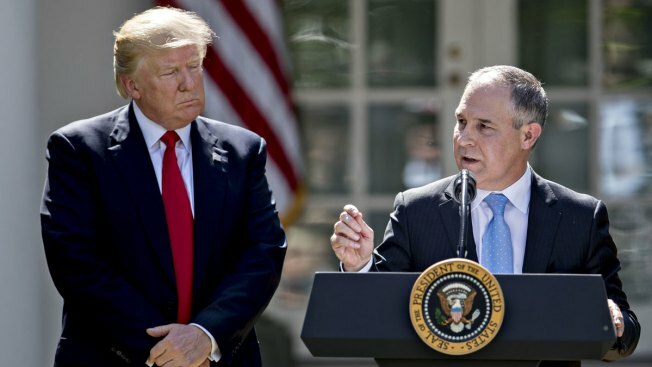 In this June 1, 2017, file photo, Scott Pruitt, administrator of the Environmental Protection Agency, speaks next to President Donald Trump during an announcement in the Rose Garden of the White House in Washington, D.C.
Environmental Protection Agency Administrator Scott Pruitt had one of his top aides reach out to Chick-fil-A's CEO last year to discuss a "potential business opportunity," according to emails released by the Sierra Club and obtained by NBC News on Tuesday. That "business opportunity" was actually an effort to help Pruitt's wife become a franchisee of the popular fast food chain, Carrie Kurlander, the company's vice president of public relations, confirmed to The Washington Post. The newspaper first reported that while Pruitt never succeeded in speaking with Chik-fil-A CEO Dan Cathy directly, he did talk to someone in the company's legal department, revealing that the "potential business opportunity" was one he sought for his wife, Marlyn Pruitt. Chick-fil-A did not respond to a request for comment from NBC News. The EPA also did not respond to a request for comment Tuesday.